L: 82.5" x W: 39" x H: 43.5"
Thorburn Power Reclining Sofa Your modern living room awaits with this Thorburn power recliner sofa. Complete with durable upholstery, one-touch power controls and an adjustable headrest, finding that seated sweet spot is a breeze. Cup holders and a storage console add to the convenience of keeping drinks, snacks and remotes close by. Go ahead—treat yourself. Your modern living room awaits with this Thorburn power recliner sofa. Complete with durable upholstery, one-touch power controls and an adjustable headrest, finding that seated sweet spot is a breeze. Cup holders and a storage console add to the convenience of keeping drinks, snacks and remotes close by. Go ahead—treat yourself. Fantastic quality and impressive attraction along with quality customer service Thank you! Very comfortable and reasonable price. Not sure how long it will last since it is bonded leather (all my other bonded leather couches have peeled significantly within 5 years) but very nice for the moment. Oscar, thanks so much for taking the time to leave this review! We're so glad to hear you had such a wonderful experience with our team. If you'd like to leave a review for the specific showroom you shopped at, please visit our Google or Facebook pages—we're sure the team would greatly appreciate it! 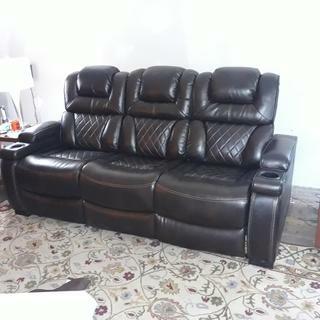 We had a wonderful shopping experience buying our power reclining sofa and chair. Everyone at the Raymour and Flanagan outlet was exceptionally knowledgeable and extremely helpful. We are loving our new furniture. Really love the comfort and versatility of the sofa. The sales people at Raymour and Flanigan are top notch. No pressure. We have had our couch for a few months now and we love it. At least the two outside reclining seats. The middle position is a little soft for us (we are tall and I am heavy). If I could change anything it would be to have the foot rest farther away but I have not found any power recliner that offers that option. If you are less than 6 feet tall it is not an issue. So in summary, so far so good. Better than the picture in real life! It is Everything I was looking for and very happy! It is Everything I was looking for! And I’m very happy! It's a great product! I would absolutely recommend it to anyone looking for quality furniture. Will this peel over time like fake leather? BEST ANSWER: Just wanted to add in here that although I've only had it for two months it has been used quite a bit. I've had plenty of guests on a daily basis. So if you consider wear and tear of an average family of 4, my sofa is like over 6 months old. Kids jumping on it, using the power recliners multiple times a day everyday and knock on wood, it has held up just fine. I would definitely recommend them. Hope the extra information helps! Yes it will I have called 2 times for service to repair my recliner for that is where I sit all the time . Wow I had a funny feeling it would. I also found out that you should keep it out of sunlight. So far its held up. But i've only had it for a little over 2 months. Only time will tell how it holds up. Are the seat cushions stationary or removable? What is the height when it's fully reclined? Need to know if it will fit in my door which is 33-34 inches. BEST ANSWER: Hi Jamal. Although every delivery situation is different, this sofa does have removable back so it should be able to fit through your doorway. How much weight can the sofa handle? BEST ANSWER: Ashley Furniture does not provide weight capacities. A general weight capacity would be 250 - 300 lbs.